What you have learned in Part 1 and 2 is the most important thing you need to know when studying the Bible. These methods mean nothing if they are not approached in the way described in those parts on Bible study. There are many ways to study the Bible. Some of those ways are described below. Let the Holy Spirit lead you. He may lead you to even more ways to study, ways that He wants you to learn and that is much more important than mastering study methods just for the sake of mastering study methods. As always, pray before you embark on a study. Ask the Holy Spirit to really speak and guide you. Allow Him to open up the Word to you in ways that only He can. And get you a Strong’s Concordance. It is the most useful book I have ever found for Bible study. You can look up any word in the Bible and it will tell you all the other places that word is used in the Bible and will key you to the Greek or Hebrew dictionary. Going to the original Greek or Hebrew will give you some great insight as to the meaning of the word you are researching. It is also great to have if you can’t think of but one or two words in a particular passage but don’t know where to find the verse. This concordance is going to be useful for many Bible study methods, particularly, word study and chain reference study. One method of studying the Bible is called a Word Study. In this method you look up a word like ‘peace’ for example. You look up this word in your Strong’s Concordance and you will see lots of references to it. You then go through and read all the corresponding scriptures that contain the word ‘peace’. Write down all of these verses or at least the ones that stand out to you. Look at the references from the Greek and Hebrew and write down the different words used in these languages and write them down. It also helps to just look the word up in a regular dictionary and write down the definition you find there. Now take some time to think deeply about what you have found. Meditate on your findings. Write down your insights that the Holy Spirit has spoken to you. You may even want to write a short summary of all that you have learned. 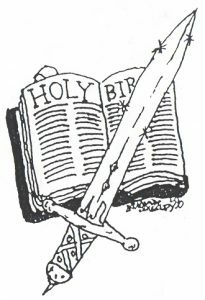 Many study Bibles on the market today are ‘chain reference Bibles’. There are usually tiny letters written next to a word in a verse. You go to another column and look up the letter given and it will tell you where the chain reference begins and where the next reference is. If you follow this chain reference it will help you to study. Another way to make your own chain reference is to get the Strong’s Concordance and look up a word or subject and look up all the verses it gives you on the subject. This study method is similar to a word study but can also be used on subjects as well as words. Another way to study the Bible is to pick a character from the Bible and look up all the references on this person and study their life. Make notes, write down verses, even look for references on them from other places than the Bible. Then, write it down like you were writing a theme or a book about the person, if you can. You can study them from a purely chronological study of their life. This is useful but don’t neglect what inspires you about their life. Think about the mistakes they made and what they did about it. What good things did they do? What did they say and teach? What did you learn that you can apply to your life? Pick a book of the Bible and study it. Do an outline of it. List the characters. List the doctrinal points and teachings. Is it a book of prophecy, poetry, doctrine, teaching, history? Who was it written by? Who was it written to? Why do you think it was written? What inspired you about it? What is one thing you remember the most? Pick a chapter from the Bible and do kind of like you did for the book study. Now pick out the one verse that stands out that seems to summarize what the whole chapter is about. Pick a subject, like, Jesus’ parables, for example. What do the parables teach? Who is He speaking to? How does it apply to you? Or pick a subject like prophecy. What chapters and books deal with things that are yet to come? What signs are given to look for? What will happen in the last days on this planet as we know it? Memorization is very useful. Verses you memorize become part of you. David said in Psalms 119:11, “Thy word have I hid in mine heart, that I might not sin against thee.” They come to memory when you need them most. You can memorize key verses from chapters that stand out to you. You can memorize verses on one subject, like, verses on victory. There are some good resources out that will help you memorize. A book that is topically arranged on Bible promises is good for this. Also Navigators has some memory cards arranged in packets on a subject small enough to carry around with you. Something that is useful as you are reading the Bible is to come up with a system of marking a symbol by verses that mark it as a verse on a certain subject. For example if a verse is about victory you might draw a little sword or if it is about prayer you might draw praying hands. Just keep it simple and draw up a little key to keep in your Bible. If you’re not very artistic you might want to use different colored hi-lighters for different subjects. Well, I hope this study has opened up a whole new world to you about the Bible and how important it is to each of us. If you are confused about versions or have a question about the history of the Bible or what the apocrypha is and why it was removed from the Bible, let me know. If you have any questions at all let me know.